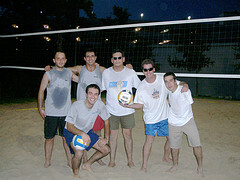 These handsome gentlemen are the best(*) team in the NI Summer Volleyball league. Feared by other teams and absolute owners of the net. The Masacotes de Tlaquepaque (formerly known as Masacotes de Chicontepec and sometimes refered to as Voladores de Papantla) is integrated by El Mota, La Urraca, El Bulldozer, myself, Jaramillo and the self-proclaimed captain Masacapi. Missing in the photo is star setter and babe magnet Gustavocote who had a severe case of diarrhea that night. *Definition of best: team with the hardest name to pronounce for english speakers.